In 2014, watch manufacturer Parmigiani Fleurier and automaker Bugatti collaborated to bring us the Bugatti Aerolithe, a watch appreciated by many for its easy wearability and rather acceptable price range. In 2017, the watchmaker adds a “trophy” to its Bugatti Aerolithe line with the all new Bugatti Aerolithe Performance, an ode to the beauty and mystery of Jean Bugatti’s Aerolithe car. The timepiece’s case is made entirely from titanium, a metal found in the meteorites that race through our atmosphere. Parmigiani excelled at going beyond the capability of conventional machining by using laser technology to apply distinctive finishes on the Performance, a high-tech piece it labels as “The mark of destiny”. The proprietary PF335 movement and its flyback chronograph module drive the Bugatti Aérolithe Performance. The movement is decorated with the classic “Côtes de Genève” finish. The dial is split into two parts, and this continues onto the angled section of the bezel, where the indications are a nod to the exceptional performances of modern-day Bugattis. The counters at 3 and 9 o’clock have keen angles and are finished with a circular satin grain. The stepped counter at 3 o’clock is formed of three half-levels, each of which has a different textured effect. In a nod to the world of high-speed pursuits, the double tachometer has km/h indications in red and mph in blue in reference to the signature Bugatti colors. 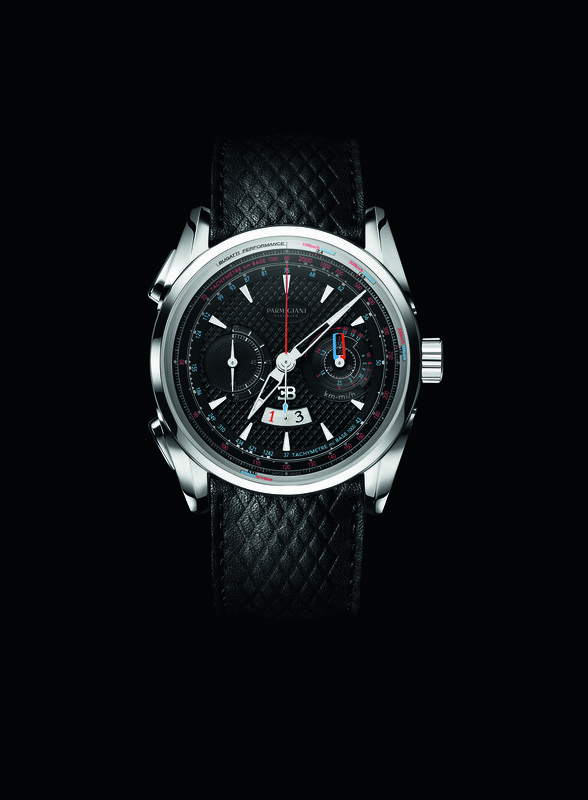 The double tachymeter (km and miles) on the minute chronograph counter runs continuously in periods of 30 minutes. 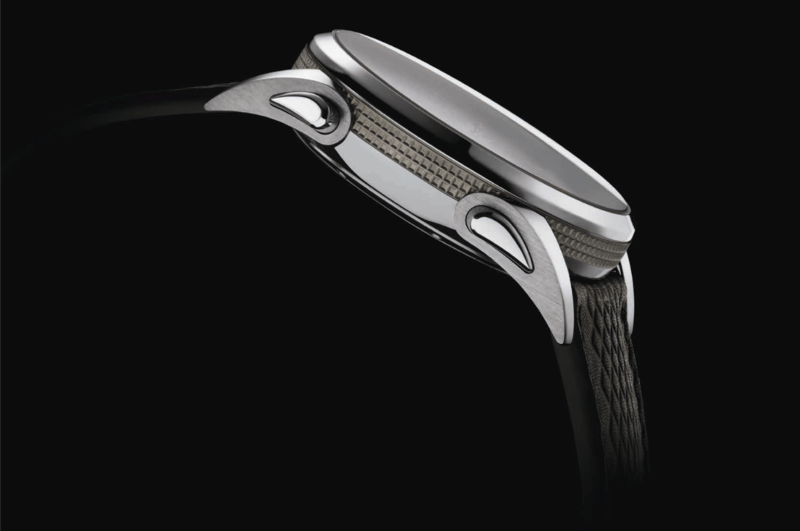 Many striking elements contribute to the personality of the timepiece; the Delta-shaped hour and minute hands, the red “1” numeral on the date and the double hand at 9 o’clock all bear the hallmarks of Parmigiani; the lugs feature the dorsal seam of the Bugatti Aérolithe car; the strap is inspired by the embossed pattern of the manufacturer’s seats; and the deployant buckle is is textured to match the dial. All in all, this edition of the Bugatti Aérolithe Performance gives time and speed fans something to talk about!